Jouk Inthesky is a freelance graphic designer, illustrator, street artist and documentary photographer born in Barcelona, Spain. He has traveled and lived around the world, and has worked for international companies and other well-known professionals. He has been involved in projects related to art direction, corporate identity, illustration, screen printing, marketing and show and exhibit production (Cirque du Soleil, IMC Toys, Ferran Adrià, The New York Times Magazine, etc.). His artwork has been awarded and published in several books and magazines (The Other Hundred, Stickers: Stuck-Up Piece of Crap: From Punk Rock to Contemporary Art, Eikyô magazine, Furia Mag Art magazine, Photography Served – Behance, etc.). 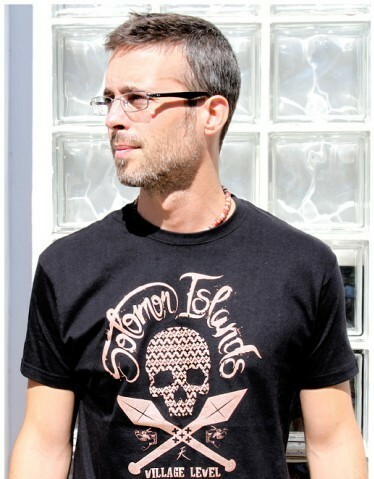 In 2011, he launched the “Proyecto Islas Salomón – Malaita Project” in the island of Malaita, Solomon Islands. The project supports local artists and different communities from remote villages of the island by teaching screenprinting and dyeing techniques mainly to youth and women. Thanks to crowdfunding, the project has supplied water tanks, toilets, art supplies and soccer equipment over the past 4 years (Malaita Project).